As you look through all the seed and plant catalogs, make plans to raise a few flowers from seed this year. You can even slip some into the vegetable garden. Marigolds and tomatoes are a classic combination. Nasturtiums, too, look good in the vegetable garden and in a salad. Violas might soon end their wintertime reign in the South, but they will brighten an early spring garden up north. Plant the violas when you plant your peas and potatoes. You can sugar the viola flowers and use them to decorate cupcakes. Zinnias are some of the easiest flowers to grow from seed. Just be sure to give them their own space in the garden. Air circulation around each plant helps to keep the plants from developing unsightly mildew. Zinnias and mildew stick together like glue. Look for some that will resist mildew. For children, the funky somewhat brain-like heads of cockscomb are fun to grow. Fun for funky-brained adults, too. They have a velvet touch and are very deep red. Majestic is the word for sunflowers. If you work and want to see their faces when you come home, siting them correctly is important. They turn their faces to the sun and follow it throughout the day. Plant them so that you will face east to view them. That way, they will face you in the evening. 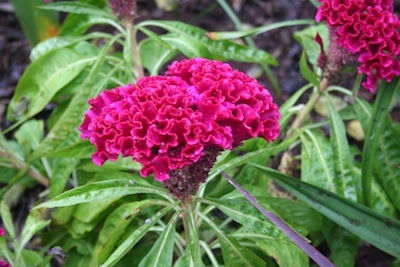 Now for an unusual flower we don’t think of growing from seed. Cannas are usually grown from rhizomes, you say. True but there are selections of lower growing cannas that you can grow from seed and that will bloom that first year. Their colors, too, are a bit more subdued than their old-fashioned relatives are. They will make rhizomes in their time and can be dug and stored indoors in the cold areas of their range or left in the garden in more southerly climes. Hollyhocks are tall and fun for adults as well as children. They seldom need staking. Their stalks are sturdy with flowers opening bottom to top. 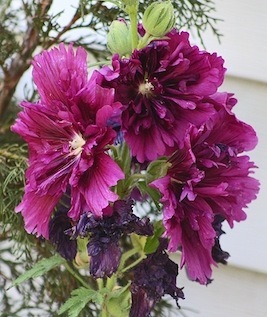 The beautiful hollyhock shown here came out of a seed mixture called Country Garden from Park Seed. I remember turning the hollyhock flowers upside down to make dolls with billowing skirts when I was a youngster. You can make some memories with seeds, too.